1.Please unplug the electrode protective sleeve before use. 2.Press the switch,place the electrode into the test solution. 3.After the numerically stable,press the HOLD button and take it of the solution to read. 4.After reading, turn off the meter.wipe clean the electrode before sleeving it. 1.The instrument is a professional instrument,please under professionals instructions in order to avoid instrument failure. 3.Please adopting standard buffer solution calibration,incorrect calibration would cause measurement error,thus affecting the accuracy of the test solution or cause the instrument out working properly. 4.Do not thrown the instrument into the test solution to avoid the circuit board short circuit. 【POCKET SIZE】Handheld design and small size make it convenient for you to carry it everywhere you want.The cases protect testers from sharp objects. 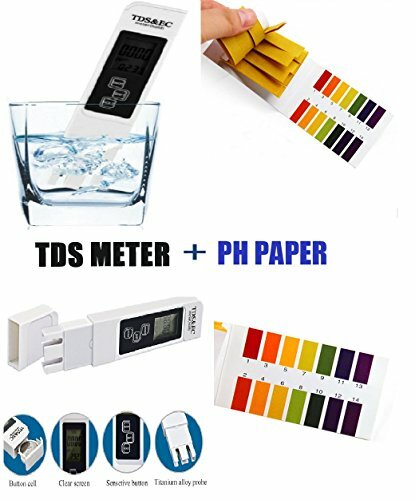 【EASY TO USE】 TDS meter could hold the measruement data by the "Hold" button,and turn off automatically after five minutes of non-use. 【WIDE APPLICATIONS】Great for water filters, food (vegetable, fruits) and drink quality monitoring, pools and spas, aquariums, hydroponics, etc. 【WHAT YOU GET】1*TDS EC temperature meter,1*Free Leather Case,1*User Manual,30 Days Money Back Guarantee.